It was an age of conflict and invention, colonialism and communism, war and revolution. The Modern World was (and is!) an exciting time to explore. Using Story of the World Volume 4 and the Usborne Encyclopedia of World History your spines, you’ll study the rise and fall of world powers, the race to the space age and witness the creation of inventions that would change the world forever. You and your child will enjoy a variety of beautiful read aloud literature this year. You’ll travel down the rabbit hole with Alice in Alice in Wonderland . Experience the Chinese Taiping Rebellion first hand with Wang Lee in Rebels of the Heavenly Kingdom and follow along with Harry as he discovers that he’s really a famous wizard in Harry Potter and the Sorcerer’s Stone . Your child will develop a love of reading as they read an assortment of fine literature this year. They’ll explore different genres, like historical fiction selections – Rodzina and Number the Stars , non-fiction – Who Was Martin Luther King, Jr.? , realistic fiction like The School Story and fantasy like James and the Giant Peach . There’s something for everyone’s tastes! The science focus this year is physics – specifically mechanics like how things work, light and color and inventors and their inventions. You’ll be using 4 main books throughout the year, which will guide your study of topics like Energy, Friction, Flight and Magnetism. Your child will complete a variety of projects this year, from designing their own working gadgets to performing experiments to explore the concepts they are studying. If you’ve been using Build Your Library all along, you’ve been studying art through the stages of history using Usborne Introduction to Art and Discovering Great Artists. This year you’ll finish both of those books – concluding your study of art through history. Your child will create masterpieces and learn about art techniques used by artist that lived during the Modern period. You’ll also study poetry – even writing some of your own, with Knock at a Star: A Child’s Introduction to Poetry . My lesson plans guide you through the school year effortlessly. Your planning is done for you so that you can spend your time on the important things, like teaching your children. New to Build Your Library or looking for some more information about our curriculum and lesson plans? Please see our Frequently Asked Questions page. 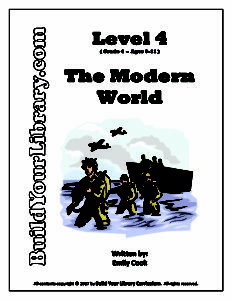 Have you already purchased Level 4 – The Modern World? We would love to hear what you think and share your experience with others – Please feel free to leave a product review on the Contact Us page! Thanks for your support!